‘i-am’ associates were interested to hear that after launching its adAPT NYC competition last summer, which sought proposals for micro apartment units to fill a building at 335 East 27th Street in Lower Manhattan, Mayor Bloomberg has announced his winner. Monadnock Development LLC, Actors Fund Housing Development Corporation and nARCHITECTS were crowned the competition winners by a panel of judges that included Paul Goldberger, Maya Lin and Bjarke Ingels. The competition received 33 entries, which is the most the Department of Housing Preservation and Development has ever received in response to an RFP. So it seems that the subject micro-living is a hot topic. The new building will have 55 apartments, (40 percent of them affordable) that will range from 250 to 370 sq ft, with nine to 10 foot ceilings and juliette balconies. Bearing in mind that the average Queen-size bed is 40 sq ft, it gives you some indication of just how small these new apartments will be – or how little furniture will comfortably fit inside them. This has led us to question where the demand for this new (rather cramped) style of living has come from? Perhaps it is due to the increasingly long hours a large number of city workers are spending in the office. For a single businessperson who spends most of their time either at work or out of the apartment, they would be throwing away money, especially when renting, on an apartment with more space than they realistically need. Still, living in a 250 sq ft apartment undoubtedly means giving up some of the amenities that most people are well accustomed to. This has been combated in this case by some amenities that might originally be located within an apartment, being moved to common spaces instead. With things like communal laundry rooms and lounges on each floor, I don’t know about you, but it’s starting to sound like a University halls of residence to us! It’s not that small apartments are unheard of; the average size of a Japanese apartment is around 250 sq ft, but it is unusual in Western society for that to be the norm. Perhaps it is because of the growing pressure of the recession and the increasingly tough financial times that people are becoming less willing to spend unnecessary money on everything from square feet to possessions. So does that mean that society is changing? Certainly it does. ‘i-am’ associates work within a number of sectors, all of which focus on drawing in customers. Micro-apartments (with the absence of any discernable kitchen) are undoubtedly a positive thing for the restaurants and bars that surround them. This could in turn, increase the demand that is laid on such social spaces. VQ (iam.didgeroo.net/our-clients/vq) was perhaps ahead of its field when it briefed us to help create a restaurant that would be open 24 hours a day and create an impact at any time of the day or night. 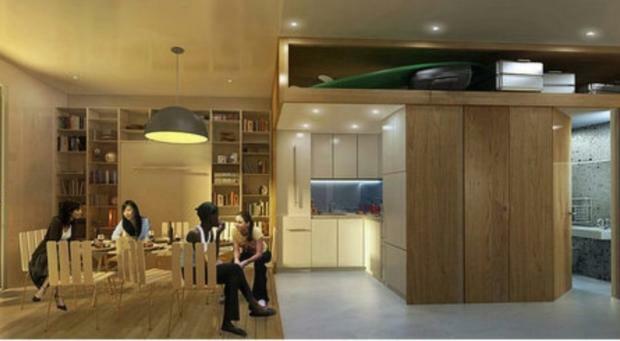 The design in New York has been developed to accommodate the city’s growing number of one and two person households, construction will start by the end of this year (with move-ins by September 2015) and the whole enterprise is intended to be a test balloon for New York City micro-apartments. The building will be allowed to circumvent certain city zoning regulations for square footage minimums and building density. If the project is a success, Bloomberg explained, it would “help make the case for regulatory change”. The affordable housing units will range in price from $940 a month to $1,800 a month. As our cities get ever bigger and our working hours get ever longer, micro apartments may well be something we will see increasingly more of, not just in America but all over the world. Interested in anything you read here? We love to hear from interesting people so get in touch!